Lucky Peach, the magazine from two of my favorites from different worlds–McSweeney’s and David Chang, is one of the few things I have had high expectations of that has managed to exceed those expectiations. I am the sort of person who likes to keep my expectations low. For example, if many trusted friends tell me I have to see, and will love a movie, such as “Lost in Translation” and I think it is a good movie, but nothing particularly special (but better than most to all other movies out at the time) I’ll be disappointed. But if I’m dragged to a romantic comedy that I expect to be terrible and it is watchable to enjoyable I’ll be pleased. I’m fickle!! I think it is a matter of judging something not against everything else, but against how good I could imagine such a thing could be. And I was worried, because I couldn’t tone down expectations on this one, yet it was everything it could and should be and more–fiction, narrative, recipes, and travelogue. Not to mention the adorable and useful graphics. Just like the phone pic of Weiner’s Wiener, I took this low res picture to prove I have this and you don’t. 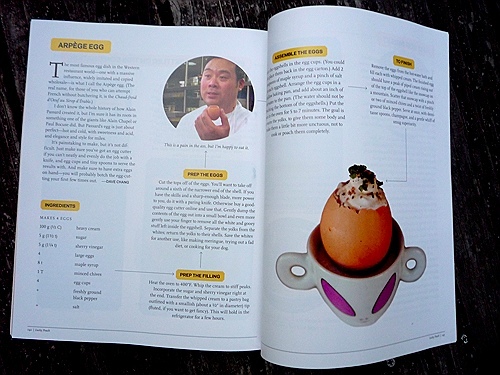 As you can see from the above picture, the recipes in Lucky Peach are presented flowchart style. This totally makes sense to me, as not only are you often following several separate foci in recipes, I view the recipes as a guideline, not a prescription to be followed, which can often be better indicated by a flowchart indicating which elements/stages are important, and which follow under those. I have never eaten at L’Arpège (as I have an income level which rarely makes high-end cuisine seem worth it to me) but was intrigued by the recipe–an egg with maple syrup, sherry vinegar, and whipped cream. My favorite dishes are those where I can’t quite imagine how the combination of ingredients will taste, or where the listed combination tastes much better than expected. So this piqued my curiosity (though I’m sure I’ll get to most of the recipes in this issue (ramen gnocchi, WTF?). 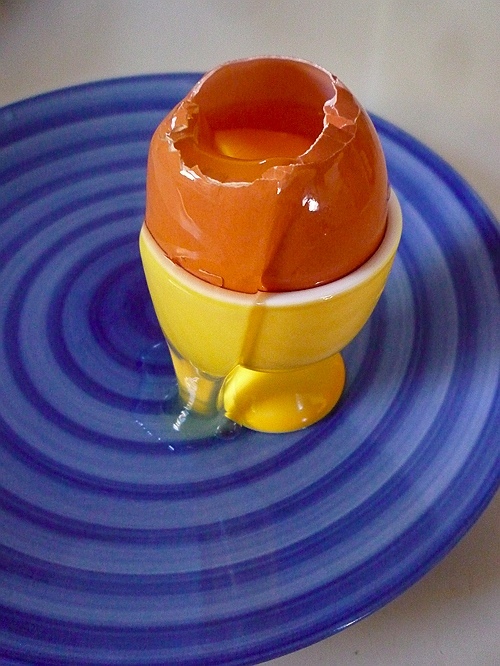 I halved the recipe, just because (it was only I eating eggs). Heat oven to 400F and prepare the whipped cream. In my opinion this is the best element of the recipe. I will definitely be making whipped cream with sherry vinegar again, as I couldn’t stop licking the whisk from this preparation. And just in case people are wondering if you can whip just 1/4 cup of cream–absolutely yes. In fact, it took so little time to whip up that I was worried about over-whipping while adding the sugar and vinegar. You can easily whip as little as 1/4 cup of cream. So whip the cream, then add sherry vinegar and sugar. Refrigerate in a pastry bag, or, in my case ziplock bag. 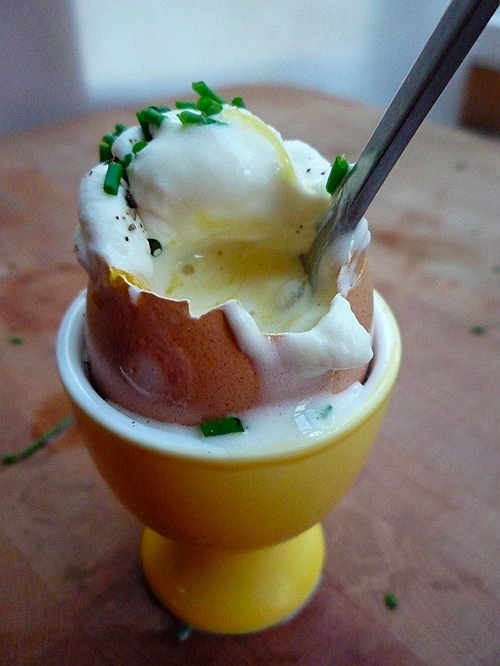 Prepare the eggs by cutting off enough of the top to remove the yolk. Initially I was quite annoyed with myself for having an egg topper in my Amazon cart for months and not checking it out (let’s not even talk about the ice cream maker), but it was not as difficult to remove the top of the egg as I had imagined. Once I pierced the top of the egg with a large needle it was easy to cut and/or broke the rest of the top of the egg off. My first attempt at egg topping. 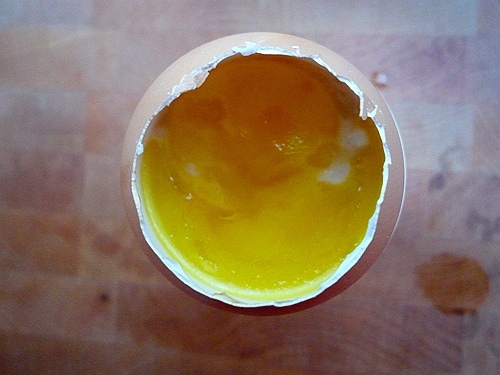 So remove the egg top and the interior. The recipe says to clean the interior egg for all white parts, but I find the chalaza (the white, ropy part) usually sticks to the yolk, rather than the shell so I did my best to pull it off the yolk. I returned the yolk and 2 tsp. maple syrup and a pinch of salt to each cleaned eggshell (which seemed like a ridiculous amount of sweetener, but who was I to question the guy who came up with one of my favorite recipes, Fuji apple salad: Kimchi, Smoked Jowl, and maple labne)? looks about right–thickened but not solid, though where did the white stuff come from? 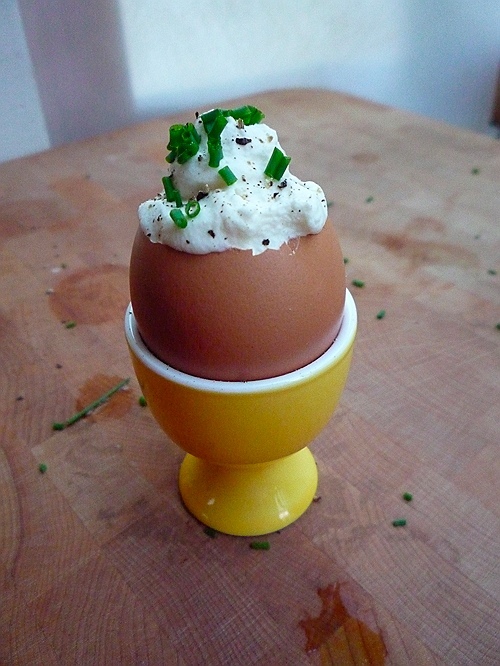 Finish the egg with freshly ground pepper and chives. I thoroughly enjoyed the production. The flavors blended so well that even though I knew I was eating an egg yolk cooked at 400F with maple syrup, it just tasted like one of the most delicious egg breakfasts I’ve ever had.